This low FODMAP Slow Cooker Pot Roast recipe is a classic comfort food made crockpot-friendly. Just 8 ingredients and 10 minutes to prep! 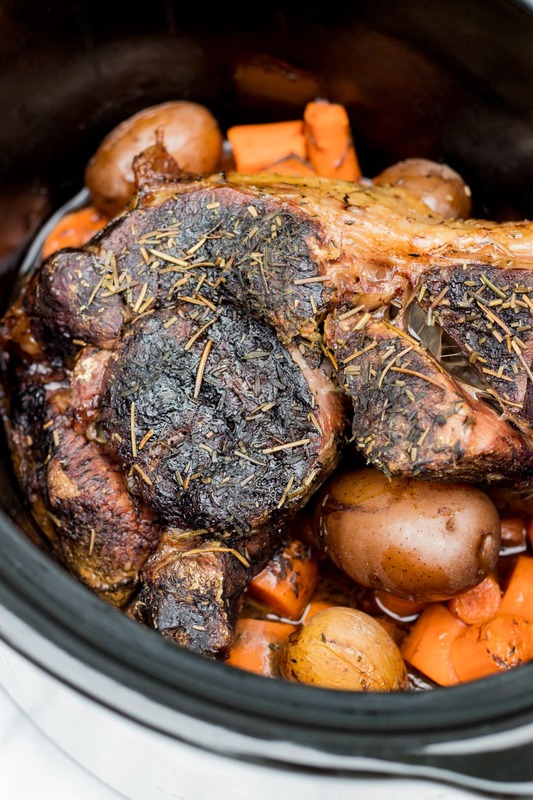 My husband “loves a good pot roast” – his words, not mine. 🙂 And honestly, I don’t mind it either. So, that means that this dish is on our menu at least once a month. 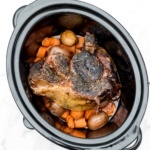 As I’m always looking to save time and make things a little easier, this slow cooker version has become my go-to. It calls for only a handful of ingredients – many of which I consider FODMAP-friendly staples – and only takes about 10 minutes to prep. It can cook while you’re at work and you’ll have a delicious and satisfying meal ready for you when you get home. The absolute BEST! Now, there are lots of other recipes out there that call for more liquid or other ingredients like tomato paste or Worcestershire sauce. Personally, I’d rather not overcomplicate things by adding a ton of ingredients and I actually prefer the no-liquid method to help prevent my veggies from turning into complete mush. Bleh. Most foods, even if they are low FODMAP, do contain small, tolerable amounts of FODMAPs and that’s why it’s recommended to stick to low FODMAP serving sizes until you have determined your individual tolerance level of specific FODMAP groups. However, there are a handful of foods that are technically FODMAP “free”. Or in other words, some foods had no detectable amounts of FODMAPs found when they were tested by Monash University. And two of these foods happen to be … carrots and potatoes! Now, I encourage eating a variety of foods, but this information does mean if you’re feeling extra hungry you can eat more than the recommended serving size of these FODMAP “free” foods. And just a reminder, the best place to find accurate, up-to-date serving size information is on the Monash FODMAP app. It is my number one recommended FODMAP resource and I highly encourage you to get it if you’re following a low FODMAP diet and don’t have it already. This is not sponsored. I just highly, highly recommend! You can do like my condiment-loving husband does and enjoy this pot roast with a little (or in his case, a LOT of) ketchup. (Insert: facepalm emoji.) If you’re low FODMAP-ing, Fody Foods Ketchup is a delicious option. I often find the meat, potatoes, and carrots to be enough for a filling meal, but if you are looking to add something else, maybe consider a salad of greens with a FODMAP-friendly vinaigrette or a handful of grapes. Place potatoes and carrots in the bottom a slow cooker. Set aside. Heat oil in a large skillet over medium-high heat. Season beef roast with salt. Once skillet is hot, sear the roast briefly on all sides to help lock in moisture and flavor. Transfer beef roast and any remaining oil (for added flavor) to the slow cooker, placing the roast on top of the veggies. Add rosemary and thyme, sprinkling evenly onto the top of the roast. Cover and cook for 8 hours on low or until roast is done. Remove roast and shred or slice as desired. Using a slotted spoon, remove veggies. Either discard remaining liquid or add shredded meat back in and stir to mix. Serve roast and veggies warm topped with optional minced chives. Yup made the pot roast the other day. Sent it out to our other farm for cold meat so I didn’t get to try it but the guys all gave it the thumbs up for sandwiches. The veggies left over from the bottom I kept here and browned them off in the frying pan for dinner side dish and they turned out great. Kept the juices also for potential stock as it wasn’t too fatty at all. Yum yum and so easy. Thanks Emily! ? 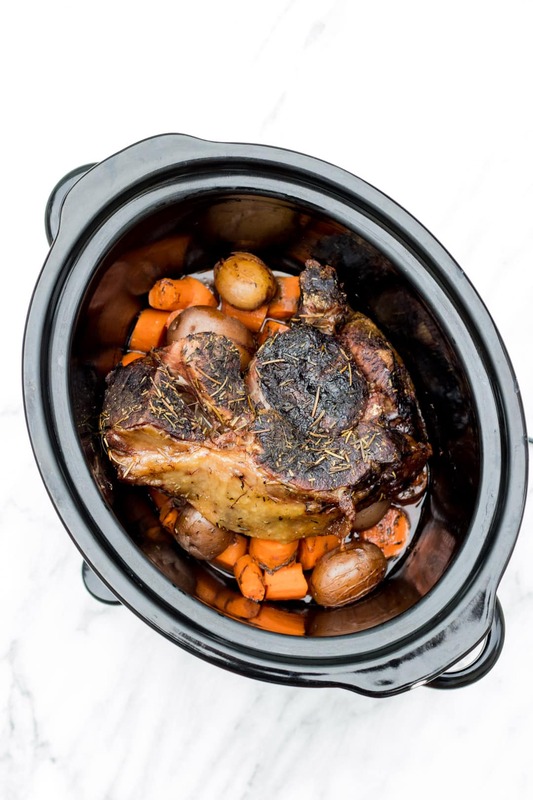 Yay for the slow cooker …. and yum yum pot roast! Coming into summer here in Oz but will be great for cold meat for harvest lunch boxes. Will try it out soon. Also made your Nasi goreng the other night – delicious, you got the flavouring just right. Thanks for all your recipes and info Emily, it’s a great blog amongst many, really enjoy it …. and your happy persona! Ps banana bread is yum too? Thank YOU, Rachelle! You have no idea how much comments like this mean to me. I’m glad you liked the nasi goreng and banana bread, please let me know what you think of the pot roast when you’re able to give it a try. 🙂 Thanks again, Rachelle. I appreciate you!